Lance Ulanoff, the editor in chief of Mashable, probably said it best when he said that implementing the SOPA (Stop Online Piracy Act) would be like returning to the Dark Ages - back when the World Wide Web hasn't been launched yet and everything for most of us was, well, boring. 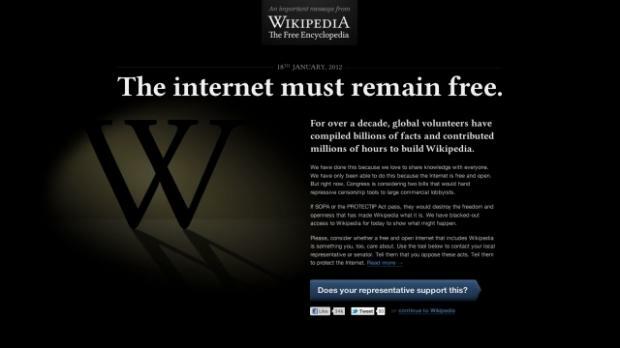 A few days ago, Wikipedia founder Jimmy Wales announced that the popular resource site will shut down for 24 hours today, Wednesday, to protest against the SOPA. There is no doubt that Wikipedia has become the world's most beloved resource site in the Internet. To support the cause many other internet giants like Google, reddit, Mozilla, Wordpress, tumblr, Vimeo, flickr, 4chan, Wired, Imgur, Namecheap and thousands more also protested their views by participating in the organized "virtual protest". Last year, Wikipedia had over 420 Million unique visitors every month with over 20 Million articles across 300 languages online. While today's protest will only affect the English version of the site, it is important to note that Wikipedia accounts for approximately 25 Million visitors daily - an obviously scary situation for every English-speaking Wikipedia fanatic. If you will head over to the site right now, you will be confronted with the compelling line "Imagine a World Without Free Knowledge". What follows are a set of instructions that will give you the option to reach out to the U.S. Congress in hopes of melting the phone systems in Washington. On the other hand, the Wall Street Journal said that a Wikipedia representative has confirmed that the mobile version of the website will continue running online (Check out en.m.wikipedia.org). Other popular sites including Reddit, WordPress, Mozilla and Google are joining in the protest as well. Remember that when this bill passes, YouTube will be kicked out too! And that would also mean goodbye for Twitter and Tumbr as well. It's scary isn't it? Help us in condemning SOPA by visiting Reddit's official website right now.